"41AN1-28, Burial E-5" by Timothy K. Perttula and Robert Z. Selden Jr.
DECORATION: The bottle is decorated only on the neck. There are two horizontal engraved lines near the rim, and the lower engraved line has six hatched pendant triangles. TYPE: Hume Engraved, var. Allen? Hume Engraved, var. Allen (?) 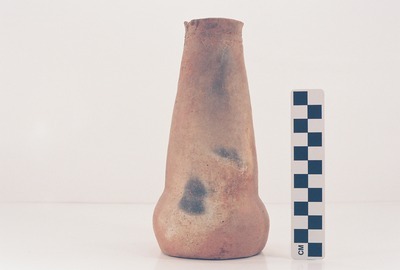 bottle (Vessel 41AN1-28).